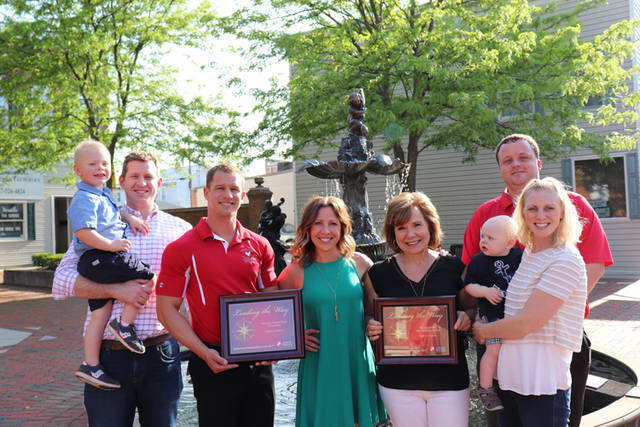 The Knapke family and Poultry Days were recently recognized by the Community Blood Center as a Platinum Partner. Pictured (l-r) are Doug Knapke with son Henry Knapke, 2019 Chairman Alex Luthman, Rachel Durham, Lois Knapke, Megan Knapke with son Maxwell Knapke and 2022 Chairman Dereck Smith. Not pictured are Lisa DiRenzo and Emmy D’Antonio. VERSAILLES – The Knapke family and Poultry Days were recently recognized by the Community Blood Center as a Platinum Partner by achieving 100 percent efficiency and collecting 121 units in 2017. This Blood Drive has been hosted by Poultry Days for 23 years, and in 2017 the board began partnering with the Knapke family to make the Poultry Days Blood Drive a memorial drive for Steve Knapke. He dedicated many years of his life to donating blood at Versailles blood drives. Poultry Days thanked the Knapke family for its partnership in the annual blood drive and looks forward to helping save lives though this year’s drive, which will be held on Sept. 17 at the Versailles K of C Hall. Appointments are recommended and can be made at www.donortime.com.